What’s your superpower? What makes you unique? What’s that special something you have to offer the world? Ya know, that magical quality that makes you, you. Can you name it? Describe it? Tell someone in one sentence what it is? How Do I Find My Superpower? If not, don’t worry, you’re likely not alone in this. It’s one of those cliche sayings, but I really do believe that we all have something that makes us uniquely special. Call it natural talent, or even strength. The problem is we spend so much of our lives institutionalized into sameness. We all learn the same things, value the same qualities, promote the same lifestyle, admire the same careers, idolize the same talents, that it’s not surprising that so many of us don’t know what our superpower is, or that we even have one. It’s time to shift your mindset and focus in on yourself. 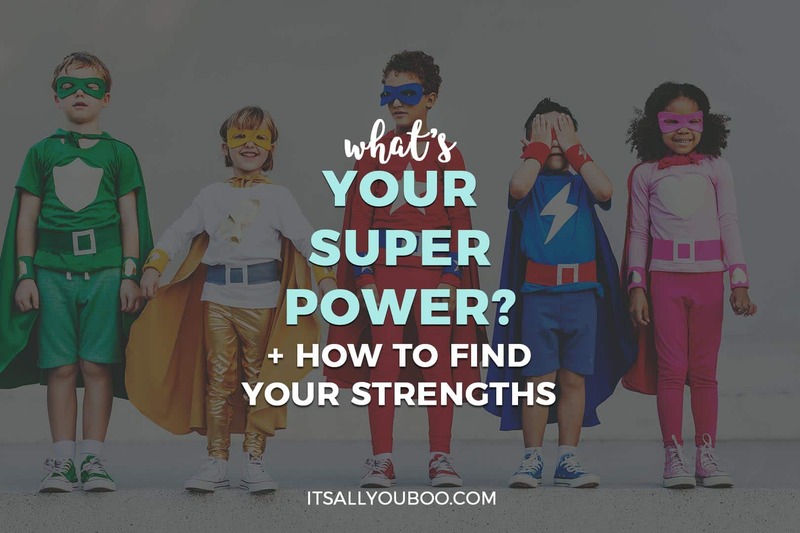 That’s the only way to find your strengths and discover what’s your superpower. We’re not talking about flying, walking through walls or leaping over buildings in a single bound, even though that would be super cool. A superpower is more than just something you’re great at like a natural-born talent (aka your power). It is greater than you and is the perfect combination of your talent, your passion and your actions (what makes it super). Your talent is an ability that you possess a natural and extraordinary aptitude for. Unlike a skill which is learned, a natural-born talent just comes easily to you. It makes sense to you, you learn it quickly and you excel at it without much help. Your passion is not only something you care about and interests you, it is what you live for and are dedicated to. A passion requires commitment on your part. You’re not passionate about it if you’re not committed to it. Passion usually consumes so your passion should be obvious to an observer. Your actions are the moves you make to use your talents infused with your passion for doing something. Without the activating component of taking action, it’s not a superpower, it’s just something you could do but never do. Your actions activate your superpower! When you use your superpower you should feel unstoppable, inspired, limitless, on fire, dedicated and just ready to show up and do something amazing. Like THIS is what you were made for. Your superpower makes you feel like a hero when you use it! Do you feel it yet? Even if right now you have to fake it until you make it – it’s a start! Would you believe me if I told you someone is waiting for you to realize how awesome you are? Waiting for you to say what you need to say or do what you need to do that will change their life? Maybe in some ways, you are also waiting for yourself. Waiting for you to believe that you can have better, do more, be happy, achieve your goals and be fulfilled in life. You are a freaking unicorn, believe it! 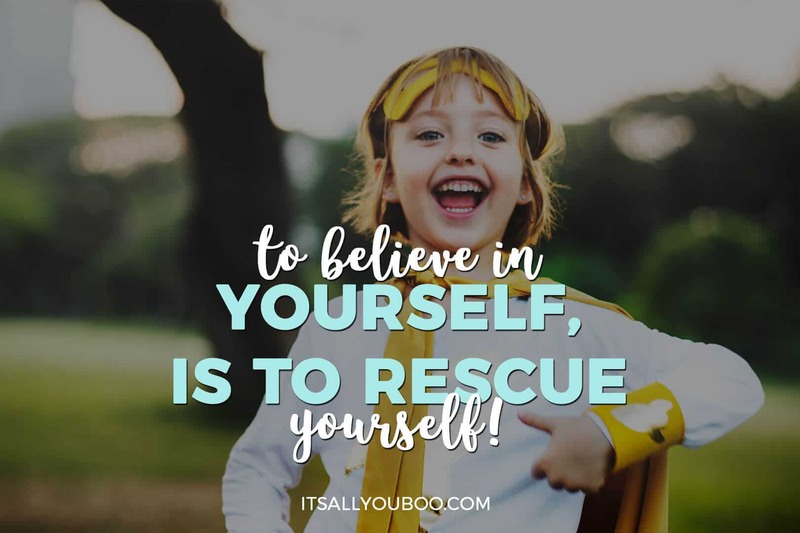 To believe in yourself is to rescue yourself. To be a hero for anyone else, you first have to be a hero to yourself. Be the hero of your own story. Own your story, own your power. Own who you are. The hero’s journey, like most, always starts with you. In case, you didn’t know, or you don’t believe as yet, let me tell you that you are amazing. And, you are completely unique. You are the only you! There will never be another. No one can do for the world or others what you can, the way you can. The special ingredient is you. You are the special sauce and this world is just waiting for you to discover your greatness. You find your superpower when you embrace “your awesome,” and accept this amazing truth about yourself. Everyone has a superpower, but everyone also has their own particular way of finding it. So, how do you find your superpower? The “science” isn’t exact on finding your superpower, but the method is very simple in a way. You go find it. Take action, both inwards and outwards. Whatever your superpower is, you’ll know what it is when you find it and use it. There will be no mistaking it. 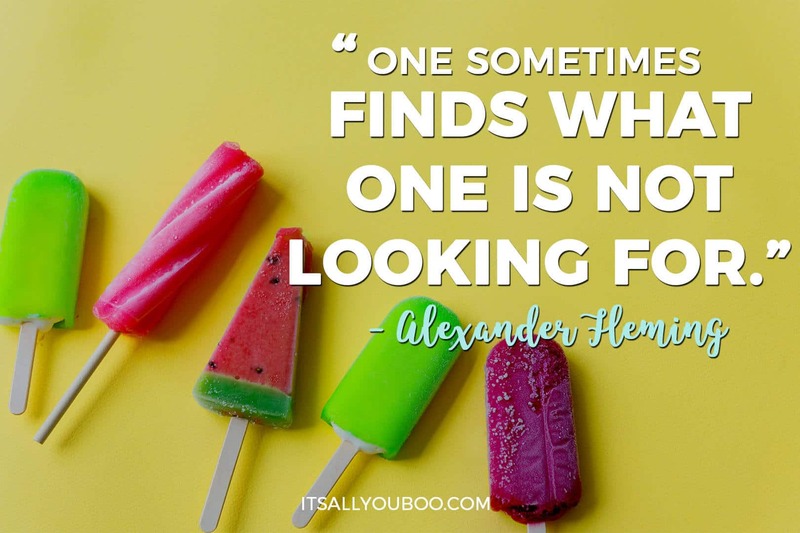 There may not be any magical one-size fits all formula for you to follow, but there are some clues and ways increase your odds of stumbling upon yours. 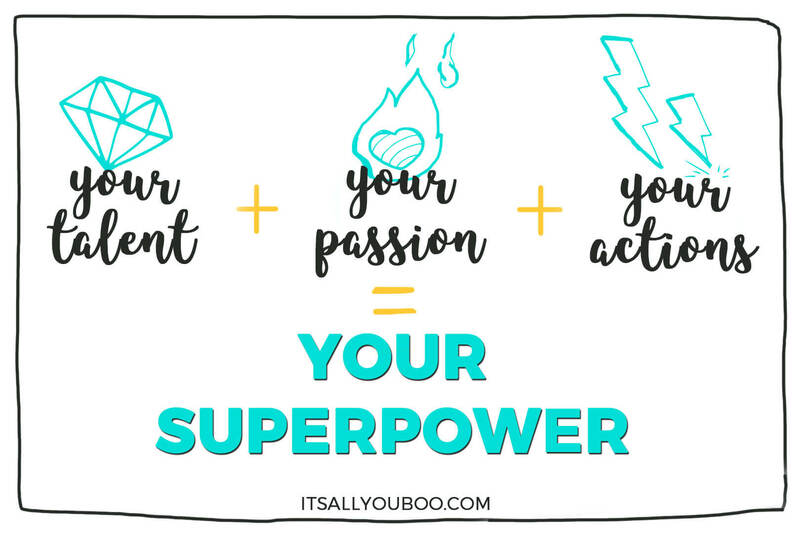 Remember, your Superpower = Your Talent + Your Passion + Your Actions. A great place to start is by focusing on any one specific aspect of your superpower. Does anything get you so excited? What actions can you take today for your talents and passions? Is there something you love doing? Don’t worry if that’s too vague, to help you here are 20 specific ways to discover your superpower. Get to know yourself, you are the most important person in your life. Love yourself, embrace your perfect imperfections and just enjoy your own company. Who are you? What do you care about? A deeper understanding of yourself comes by being alone. Let your creativity, imagination, and intuition guide you. You already know the way. You discover your superpower when you’ve embraced yourself. No pretending to be someone else, no imitating or suppressing your power, just being who you are. Unapologetically so! Unravel and unlearn the ways you’ve hidden who you are (even from yourself). You are not broken, you are not lacking. You are beautiful and complete. How can you know your superpower, when you’re pretending to be someone else? What are your natural skills and abilities? Make a list of everything you’re not just great at but extraordinary at. Look beyond “hard skill” like being good at math or coding for example, or even an “admired skill” like singing or dancing. This can be as unique to you as possible. What did you want to be when you grow up? Are you doing it? Why did you change your mind? Sometimes you have to throw off and unlearn what growing up does to you. Return to the creative, fearless, child you once were before school, work, life, and society took it from you. Live your life, say yes and be open to the possibility that you just might stumble upon what you’re looking for. Say yes to every opportunity that comes your way that you’d like. Also, learn to say no, as you can’t have new experiences if you’re stuck in old patterns of behavior that aren’t allowing you to grow and discover yourself. 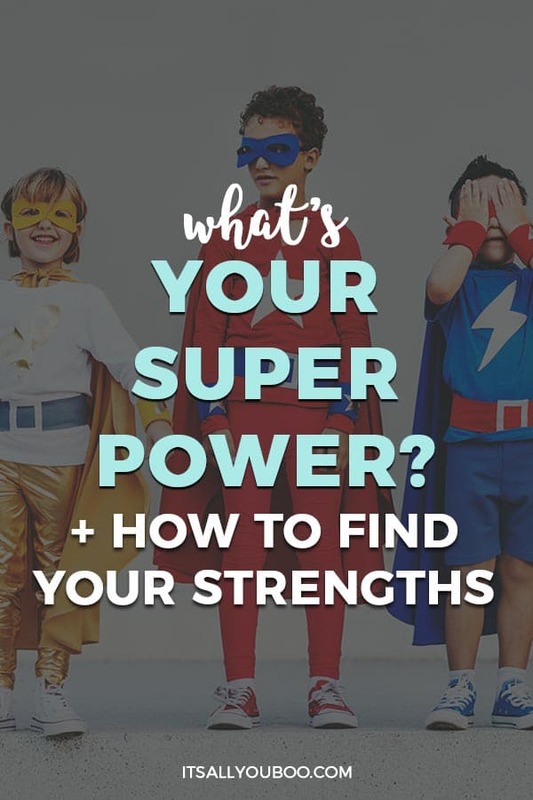 Sign up below to the guide with the complete list of 20 ways to find your Superpower. 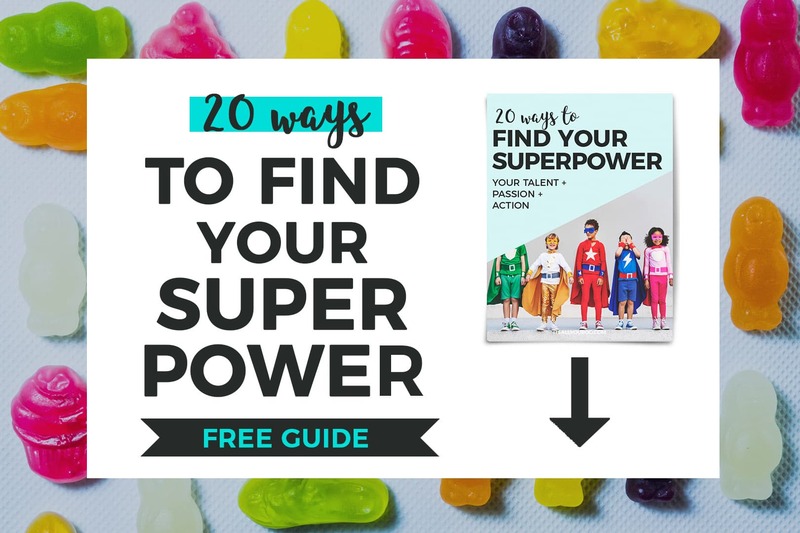 Sign up below for your FREE Superpower Discover Guide + get weekly tips to help you slay your goals. Especially, if the alternative is you NOT believing in yourself and thinking that you are less than you are. Knowing your superpower literally (yes, literally) changes everything. Even just knowing what your talents or passion is can shift the course of your life. Your superpower is your key to everything. The key to finding your niche, your voice, your mission, your purpose, and even defining your brand (if you choose to create one). Can you imagine how your life would be different if you knew exactly what your superpower was? Imagine how focused you would be, how direct and intentional the choices you make would be? How you would jump at every opportunity, confidently, ready to just show up and to be super. What a fun post! Someone once said: “Your purpose is where your passion and the world’s needs collide.” I think you’ve hit the nail on the head here. So very happy you enjoyed it! That’s a fantastic quote, I’m so going to add that one to my quote bank. This is such a great post – thank you for putting together such an awesome, multifaceted resource! 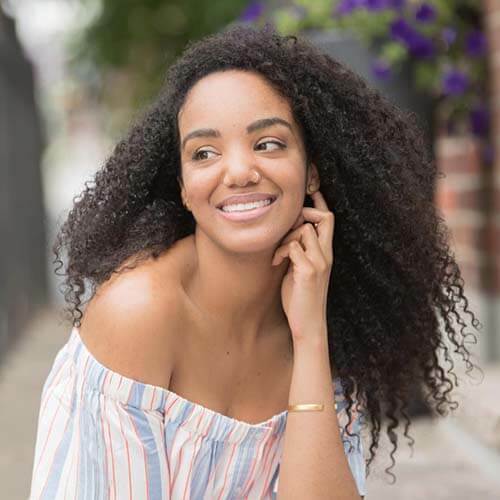 It’s true that sometimes you need to step back from the world and take a different perspective to realize what it is that you’re meant to be contributing – not just what you’ve found yourself pigeonholed into, but what you’re called to do based on your unique experiences and skills. So important! Bookmarking this for when I need some inspiration! Thanks so very much for the love. You are quite welcome! I am quite honored to be bookmarked. OMG yes, escape the pigeonholes! Leave them for the pigeons. You are a magnificent creature that should fly free! We enjoyed the way you spread your message within those lines. In particular, the way you engage the reader through open questions! We do really like your natural way expressing your points! Thanks for stopping by CR! Aww, thanks. I greatly appreciate that. Great post! I’d say my superpower is writing! Cause I love it! Woot! Yay for writing. It’s an AWESOME superpower. I love this! I needed a little push today. Thank you for giving that to me. Happy to be of help, keep going Diana! This was such a fun and inspirational post. I think my super power might be teaching and I think my students would love this process! It is so important to recognize what makes you special. My pleasure Brittany, so very glad that if was enjoyable. That’s an amazing superpower, so beneficial to others as well as yourself. Yes, please share it with them and let me know what they think about it. Such a great post and a good reminder for those of us who are way to hard on themselves. Yes, we are! I think there needs to be a universal holiday, “Give Yourself a Break Day.” Perhaps it should be every day. My superpower is my faith. It makes me stronger, wiser, and a better person in every way. I think that’s pretty extraordinary when I consider that the Bible itself says that “faith is not a possession of all people”. Faith is a powerful one, it spills over onto everything it touches. You are blessed to possess it. What a fun and inspiring post. I like how you broke it down into the 3 parts. I think my superpower is either leading or public speaking…I’m not entirely of which. It has something to do with my ability to lead fitness classes because that’s something that comes natural to me and I know I’m good at. So very glad that you enjoyed it. It could be a combination of both, leading through public speaking? A part that I didn’t mention in the post was that I think your superpower is what you decide it is. Part of it is just who you are and what you’re passionate about, but we choose it. That’s great, I’m sure your classes are super inspiring. I must come to one, as I am the worst at exercising. Really inspiring and motivating. Great way to make everyone feel unique. My super power is to give always 100%, no matter the task I always give my best. We are all unique – that’s the beautiful part. If only we spent the time finding what makes us so. My superpower is inspiring others to believe in themselves. I love this! It’s something that our children especially need to learn before they get sucked into a boring job! Yay! OMG yes, I never even thought about the little ones, but just imagine how amazing it would be if from an early age you were told to just be you and embrace yourself. I wish there was more room for individuality and space for non-traditional talents in the classroom. Can we look beyond reading, writing, and arithmetic and pushing kids towards the same careers? I sure hope so! My superpowers are persuasion and teaching. Thanks for the great post, Nadalie! I can confirm that those are indeed your superpowers. You are quite SUPER at it. This is a great read! I need to figure mine out I think. Definitely sharing this! Yes, you really should, it’s a pursuit well worth the adventure. You never know what you’ll find! That’s an incredible superpower. I believe at almost every woman struggles with feeling comfortable in their own skin at one time or another in her life. I think this is what teaching adulthood is really about, finding your own true passions and having the strength to fully embrace it. It’s then that one has a super power. Great share! I like that – it’s all about growing into who you are, which is so what being grown is all about. My adaptability is my super powered. I accept change well and quickly learn how to function under new circumstances. Always a joy reading your post. Fantastic superpower, it’s like multiple powers in one because you’re always changing to your environment. Love that. I believe that writing is my superpower and using it to motivate and inspire others. My writing has been that natural-born talent that I’ve ignored, even though I’ve had multiple people over the years telling me that need to use it, it wasn’t until I found my passion for just being who I am and living my dream life, that it all came together. In a way, It’s All You Boo is my superpower! I’m glad, I LOVE your posts too! This is something we all should definitely talk about more. I love the way you put it, those 3 secret ingredients. I’d like to think that my writing, particularly on personal development, is my superpower. Knowing and using your superpower to your benefit puts you ahead in life, that’s for sure. I love that, yes 3 secret ingredients for you to discover and mix together as you like. OMG yes! passion + talent + action = magic… unstoppable magic! I really love this!! I think I’ve found my superpower, but now I have to figure out how to make it my living! That’s GREAT news, finding it is the hard part. The putting it to use is the exciting, fun part. The only limit is your imagination! I LOVE this!!! I have pinned and tweeted because it’s so true and inspiring. Everyone has a superpower, it’s finding it and embracing it that’s the hard part. My superpower? I think I am still finding it, but I’m getting there. It definitely involves writing to inspire/empower women though! We’re all in this together. WOOT, so happy that you loved and shared it. Much appreciated! It is, and even once you find it, then accepting it and believing that you can. You will so get there! Keep trying new things and testing out the skills and talents that you have. It’s totally cliche, but follow your passions, they might lead you somewhere amazing. My Superpowers are teaching and helping others! I’m excited to discover that I’m doing the right thing! I like how you mentioned society pushing us all into sameness. I totally believe that’s true. There is not one right way for everyone, but we are taught to believe that if we don’t follow the “rules” we will fail. Overcoming this mental roadblock is always harder than it seems. Isn’t it exciting? Blogging and using your superpowers for good. hehe. Yes, we must resist the mold. So many people are unhappy because they built, live and stay in lives that have them confined to be someone they aren’t. Break every rule! Smash every mold! It’s totally true – the mental aspect of doing what we’re doing is so much more important than the “how-to” do stuff. If you aren’t in the right mindset, you can’t accomplish anything. <3 aww thanks lovely. I'm so happy that the method to my madness is understandable. Being a mom is an AWESOME superpower. I liked the way you have related this post with kids pictures in between and it is such a colourful and fun post. I agree we all need t remember what’s our super powers. Our super powers make us what we are. Aww, yay! So glad you loved it. I was so struggling a bit with the images for this post, I had the main image and then it hit me – CANDY! <3 thanks so much for blog love. BAHAHAH, omg seriously best answer I've gotten! OMG!!! I Love love love this post! Wow!!!! Everyone is unique and that’s their power! <3<3 so glad you loved it! Love, love, love this post. So refreshing and what I need to be reminded of all the time. i like how you talk about unlearning growing up lol. I really need to do that. I also love how you talk about being authentic. Definitely have given me more food for thought. Yup well sometimes we forget. You are awesome, and you have a superpower! I'm still working on the unlearning part. I think as we grow somehow we stop dreaming and believing that anything is possible. We have to break free. That’s a great superpower! Learning to listen to your intuition can seriously change your life. I love this post! I feel like I need to start figuring out my super power lol ! Thank you for sharing! <3 thanks for the love. Yes, girl it is time! You can do find it, just keep doing the amazing things you are now! This is such a fantastic article! I really enjoyed the journey and hadn’t thought that my current adventure could be said to be that I’m cultivating my Superpower! Yay! Thanks so much Loren, that means a lot! Yes, yes, you are! You are a superhero in training. Love it, love it, LOVEIT, Nadalie!!! When I wrote this I never even considered how it could benefit youth or children. I’ve actually had some shares on social by people who work with kids and youth. Very powerful insightful post Nadalie. And very relatable. Everyone needs to find their superpower and indeed harness it to feel fulfilled. Thanks so much for commenting. We really do, we’re taught to do almost everything else. This is such an inspirational post. I love how you are giving me the permission to see my own superpower rather than just everyone else’s. Sometimes you just need to stop and pat yourself on the back. We are all awesome, aren’t we? Thanks for the gentle yet powerful reminder to be great so others will want to be great as well. Get yourself that red cape! That’s me everyday walking around my house with a blank around me superhero style. I sure am! Be your glorious self! What a cute yet meaningful post with a super attractive title, got your readers introspecting ( my fav topic). I do see you slaying your goals and that of others too, Boo! Anyway, it took me years to realize that my superpower is being a catalyst for the successes of people I have connected with .. I can help unlock one’s true potential. You know how it is. Questions, especially questions we aren’t asked very often, or even, have that way of getting you thinking. I LOVE that, that’s an amazing superpower. In a way your superpower is helping other find their superpower. How super is that? What a fun post! So many good points. Thanks for the reminder. Yay I am so happy that you enjoyed it. Hi! Im trying to get the optin and there’s an error! I am oh so sorry about that. I’ve emailed it to you, please let me know if you receive it.